Oral-B (I should say Braun) is the pinnacle when it comes to dental products. Why would a toothbrush be an exception? It’s not! We get all sorts of features, bells, and whistles in these tiny machines. There are a lot of them as well. Take the “Pro” series for example. I can count seven or more in the lineup. Each one better than the other. But what happens when we’re crippled by the budget and have to choose one out of several candidates? Well, my friends here’s where a comparison swoops in. 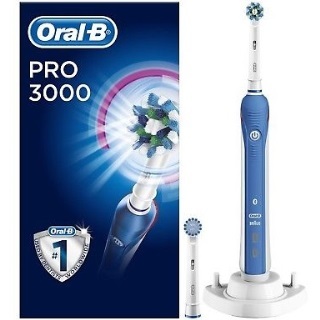 People looking to buy an entry to mid-budget brush often look up to Oral B Pro 1000, 2000, and 3000 brushes. But which one of them is the best? Which of these brushes would win the Oral B Pro 1000 vs 2000 vs 3000 battle and under which circumstances? This is what I’ll be discussing in this article. I’ve used all three of them. So, you’ll have an in-depth user perspective from me as well. Let’s get to it then! What Did I Find Out After Trying All Three Products? What Are the Similarities between These Products? 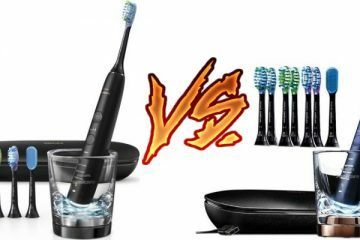 Oral B 1000 vs 2000 vs 3000: Which One Comes Out on Top? 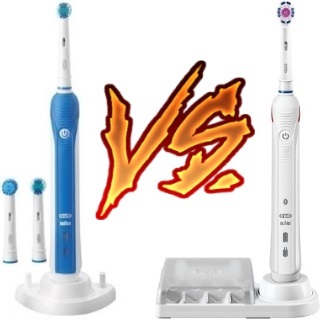 Oral B 1000 vs 3000: Which is the Winner? Which One Should People Pick? I can easily classify these three brushes within a certain price range and count the bells and whistles. That way, the comparison will be a straightforward one. Anyone could do that. I plan to dive deep instead. That’s why I decided to use each of the brushes and give you my honest impressions first. I must say my experience with White Pro 1000 from Oral-B was much better than the conventional manual toothbrushes. It provides what it preaches. Namely, people get to have a pulsating action. The brush head oscillates while cleaning. Also, it rotates to cover more ground. At the end of the day, users DO GET a 3D action (as they name it) from the Pro 1000. The cleaning action helps you by removing 300% more plaques and stains than a normal toothbrush would do. Oh, and Oral-B strives to keep the gingivitis at bay as well. Call it a complete solution if you would. There’s a nifty pressure sensor in place for the product. It stops the “Pulsating” movement if the users press the brush too hard on their teeth. Don’t worry, you won’t feel any pain thanks to a sudden halt. The trouble with manual toothbrushes is that they depend on the intuition of the user. You’ll have to keep an eye on the clock and brush for two minutes. Thankfully, using the 1000 White Pro is not that tedious. It has a 2-minute timer for assistance. Users can alter sides in every 30 seconds. Some might say, the handle is too big for them. Yes, that is the case for a few users. But trust me, once you get the hang of the product, it won’t bother you. To me, Oral-B 1000 is easy to grip and operate. People must understand that this is the “Most Basic” model of Oral-B we’re dealing with. The fact that White Pro 1000 comes with a handle compatible with three brush heads is a bonus! These three brush heads are CrossAction, FlossAction, and 3D White respectively. Don’t worry about operating this thing. Oral B 1000 White Pro complies with the rules and regulations set by ADA. Kids and senior citizens at your house will find it easy to get around and use. As I said, it’s sort of the “Entry Level Model” of the franchise. As such, I didn’t expect the battery to be “Too Good.” It’s average by Oral-B’s standards. The standard charging station delivers enough charge for the brush to run for 10 days at a stretch. My beef with this product is that it only has one mode of cleaning to rely upon. Look: I know that its conveniently priced and is a basic model. Yet, having just “Daily Clean” mode in its arsenal is somewhat of a letdown. They could at least give us one more. Also, I’d have preferred an “Automatic Shutoff System” with this brush just to be on the safe side. It keeps on pulsating well after two minutes. For people who lose track of time, handling this product can be tricky. White Pro 1000 is waterproof. 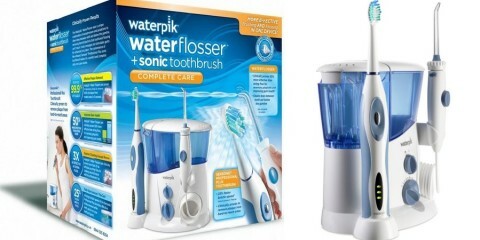 For an electric toothbrush, being water resistant helps a lot. There’s a simple on/off button to help users in coming to terms with the control system. I liked the pressure sensor that tells users when to push (and for how long) and when not to. I’d rate the cleaning performance as “Top-Notch.” The movements work wonders. This is conveniently priced for people who want a brush that cleans well and comes cheap. I found just the one brushing mode here. I expected at least a couple of them. There’re no “Variable Speed Levels” as I expected from this product either. This thing doesn’t have an “Automatic Shutoff System” like most electric toothbrushes. I’ll not lie to you, I’m an Oral-B fan. The entire purpose of me writing a 3-way comparison article of Oral B Pro 1000 vs 2000 vs 3000 is to get my testing results with these brushes out on the internet. With that in mind, 6 months back, I started using the Pro Care Plus 2000 from this franchise. I found it quite a bit better than the predecessor I once used. For example, you have two cleaning modes to play with. There’s the standard “Daily Clean” mode. For people with sensitive teeth and gums, Oral-B incorporated “Sensitive Teeth” mode that allows a wide range of people to use this. Thanks to this, children and the elderly in your house would have no problems in switching to this product from the conventional manual toothbrushes. 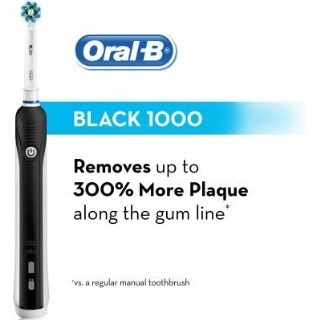 If the predecessor removed 300% more plaque than the manual toothbrushes, this one claims to remove 400% more plaque than its manual counterparts. I expected nothing less (and I got what I expected) when comparing it to White Pro 1000 from the same manufacturers. Pro Care Plus 2000 comes with a pressure sensor as well. It helps to keep the gums in good shape. Whenever someone puts more pressure on the brush than he should, the indicator flashes and beeps as well. Thus, people know when to push for it and when to let up. This little brush is compatible with FlossAction brush head. The micropulses in the brush head allows users to target plaque and stains more efficiently than they could with any other brand for that matter. The only other brand that can rival Oral-B is Phillips Norelco. Even Panasonic doesn’t come close. People will have a good charging dock to rely on when they need to boost up the battery. This charging dock needs quite a few hours to bring the battery up to speed. Once fully charged, the battery can run for two weeks without any interruptions. It’s a reliable traveling companion I must say. You need not worry while traveling. This Oral-B product works perfectly in Europe and other parts of the globe including the USA. One just has to have the appropriate adapter with him/her. I must say, I liked the product (or products) I tested. Buying Pro Care Plus 2000 actually allowed me to have two brushes with two brush heads and two chargers. That’s why I could experiment myself along with one other member of my family. I’m quite happy with my experience of using this product. If I HAVE to point out one blemish in this one, it has to be the fact that one doesn’t have the option of replacing the battery. Once the battery dies, it dies. That’s it! You need to get yourselves a new brush. People might pick an issue with the time it takes to get fully charged as well. Once docked, this device is fully charged in 17 hours. Considering it holds the charge for 2 weeks, I’m willing to let that slide. I loved the overall design of the brush including the head and the handle. It makes brushing easy. The 3D action of this product helps to remove stains and takes care of plaques in teeth. As usual, the pressure sensor does a great job in telling users when exerting too much pressure. You get 2 weeks’ worth juice when the battery is fully charged. Perfect for long vacations. Oral-B made this product suitable for normal brushing and for people with sensitive teeth. This thing is ADA compliant. So, the elderly and the children of our houses can use it easily. One cannot change and/or replace the battery of this thing without changing the brush itself. Few users might frown upon the idea of Oral-B 2000 taking 17 hours to get fully charged. Although the name is almost identical to Oral-B 1000, these two toothbrushes bear stark difference in features. Otherwise, me doing Oral B 1000 vs. 2000 vs. 3000 comparisons would’ve been futile. Hence, I tried my hands on Oral B Pro 3000 for three months. This is the first of a long lineup of products that feature Bluetooth technology from the makers. Namely, the brush can connect to your phone and pc and allow you to customize and monitor your brushing routines. It’s definitely a step up from others. Not to mention, you’ve got a 30-second timer on the handle. This thing pulsates to let the users know when it’s time to brush the other side of their mouths. Yes, in total you have to brush for two minutes. There’s a timer indicating the total brushing time as well. Oral-B has got you covered. Oral-B didn’t miss the pressure sensor that we see in other models as well. As you guys expected, the pressure sensor turns red when people put too much pressure on the brush heads. This helps to protect gums from bleeding or swelling due to careless methods of brushing. Do you know that this brush helps by protecting people against plaques and gingivitis? We have three different modes of brushing to thank for that. The three modes are Daily Clean, Gum Care, and Sensitive Teeth. We all know that Daily Clean is the normal mode people use in everyday business. Gum Care is the mode that’s essentially a brushing technique that prevents extra pressure being put on our gums. Remember gingivitis that I spoke of earlier? Well, this is the mode that guards people against the said condition. The last mode is the usual Sensitive mode for people who suffer from teeth sensitivity. The Oral-B Pro 3000 comes with a Lithium battery. These batteries are known to hold the charge for a long time. With this one, the brush is able to keep functioning for 10 days in between full recharges. As usual, people won’t be able to switch batteries when they die out. Buy a new brush altogether. What’s good about this brush is that you can use three types of brush heads with the handle. The first one is CrossAction. This brush head has bristles positioned at a 16-degree angle. It allows the brush head to clean in between the teeth. FlossAction brush head allows people to mimic the flossing action and clean the gums in the process. Combine this head with all the pressure sensor benefits and you’ve got the best out of the deal. Then, there’s the bit where you get the 3D White brush head. It’s the standard brush head you get with this product and goes well with the daily cleaning mode. One great thing about the brush is that the additional heads come with their own storage covers. That’s some attention to detail for you! My beef with the brush that you can’t really tell which move you are using without connecting the brush with Bluetooth and your Android app or pc. Also, you might not be able to use this overseas with 240V connection. 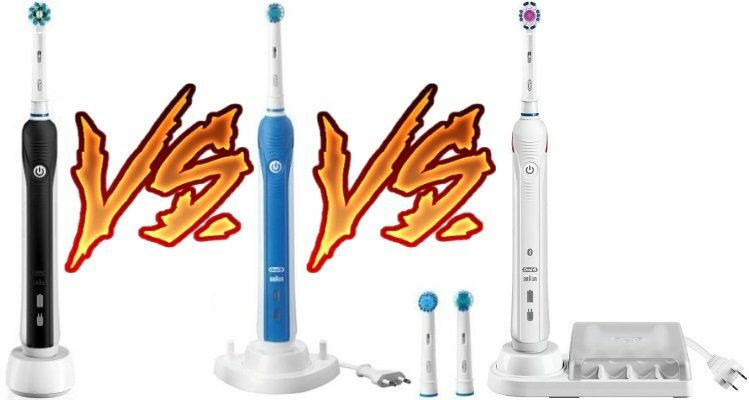 If you want to know how Oral-B 3000 stacks up with the latter model of the franchise, read my Oral-B 3000 vs 5000 comparison article. The Bluetooth technology is hands down my favorite. One could connect it to PC or phones. This little brush comes with as many as 3 different brush heads for the convenience. Three different brushing modes help in taking care of different types of mouth conditions. The pressure sensor is a great way for the users to get an idea about how to go about brushing. The 2-minute timer is a handy addition to the mix as people get a clear idea about how long to brush for and devote time to each side of mouth. The timer I spoke of can only be tracked while being connected with a PC or an Smartphone. This little thing only works perfectly within the USA with its 100 – 130V range. Being Oral B products, each of these models bears similarities to one another. That’s a given. Before we move into dissecting these devices, let’s explore the common grounds that they share. Both of these three brushes come with a great set(s) of brush heads. These things are adept at cleaning our mouths. You’ll have different numbers of heads paired with each brush but that’s a discussion for the latter section. We’ve all probably heard about the standard brushing time. It’s two minutes. Oral-B is a “Dentist-Approved” brand. Naturally, they’d have a mechanism to ensure that you brush up to the time limit. All three of the brushes have that. They are designed to change sides after 30 seconds as well. Each side of our mouths gets equal brushing time. You’ve probably read about a pressure sensor about 4 – 5 times now. Each of these brushes come with a pressure sensor that warns people if too much pressure is put on the gums or teeth. It makes brushing a painless experience for the young and old. The Lithium battery is apparently a thing for Oral-B. This lot comes with Lithium batteries as well. They are irreplaceable. Yes, depending on the model you choose, the charging and runtimes are different but again, that’s a discussion for another section. Turning each brush on and off is really simple. People have access to a button on the handle for that. Operating these brushes is no fuss at all. You won’t find any travel cases with any of these brushes. Yes, Pro 3000 comes with a case for brush heads but it’s different than a full-fledged travel case which guards every part of the brush. Right! As we skimmed through the similarities, it’s time to put all three products to the acid test and see which one comes out unscathed. I’ll be drawing the comparison on the basis of my experiences with these three brushes. Without further ado, let’s get to it! Oh… this is a fun battle. Don’t get me wrong, both of these products are far better than their manual counterparts. On the surface, they might look the same. But there are subtle differences. For example, the Pro 1000 has no matches when it comes to removing plaques. The Pro Care Plus 2000 has no competition when it comes to protecting gums against gingivitis. These brushes are a bit different when it comes to brushing modes. 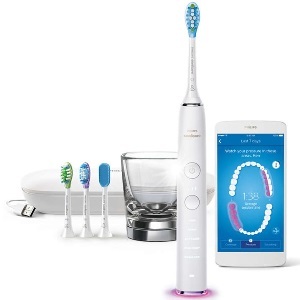 The Oral B Pro 1000 comes with only the “Daily Cleaning” mode. The upgrade (in this case, Pro 2000) comes with the additional “Gum Care” mode along with the default one. So, if you want a brush to sooth your gums, go for the latter. There’s a slight difference in case of battery life as well. Oral-B Pro 1000 is the “Entry Level Toothbrush” of the bunch. That’s why you get 10 days’ worth of juice from its Lithium-Ion battery. Although, rigorous brushing will bring it down to a week (more or less). When it comes to Pro 2000, the battery life extends to 2 weeks. The price is not very high when compared to the predecessor. That’s why I find it a tad better deal to buy the 2000 version. 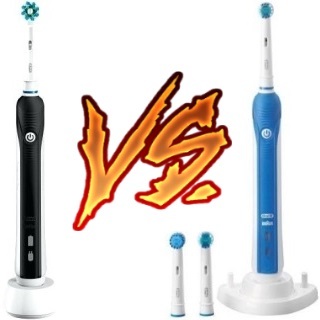 In other words, Oral B Pro 1000 vs 2000 championship goes to the latter device. But only by a whisker. For me, the true comparison starts here. These two devices are very much same on the surface (a redundant statement, but true). Yet, you’ll find Oral-B Pro 3000 to be a bit more competent than the earlier version. It comes to you in two colors as opposed to Pro 2000 which only has one to resort to. But is “Color” the only difference? Surely, not. Pro 3000 comes with Bluetooth connectivity. One can pair this brush with his/her smartphone or PC to monitor or make changes to the brushing routine. With Pro 2000, there’s no way of doing that. I guess this round clearly goes to Oral B 3000 then. The users have three cleaning modes when it comes to the latter model. With the Daily Cleaning, and Gum Care you have “Sensitive Teeth” mode as well. This makes it easy for elders and children suffering from a toothache to use it when needed. 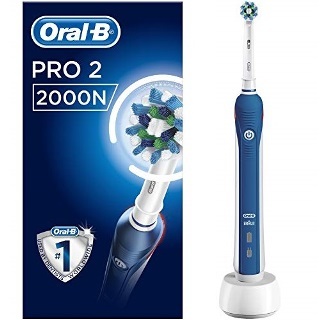 Oral B 2000 Pro Care Plus has just the one brush head in the package. Pro 3000 has 2 in addition to the standard one. Additional brush heads work well in expanding the range of this product. Oh, and you get an additional stand to keep these two brush heads intact as well. The battery life is almost identical between the two models. So, there’s nothing much to nitpick there. 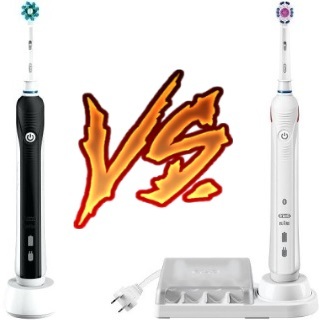 I’d say the Oral B 2000 vs 3000 battle is neck and neck. Pro 3000 has the extra cleaning mode When selecting one of these two people should look at the cleaning performance and it’s almost the same. Unless you need a toothbrush for sensitive teeth, choosing Pro Care Plus 2000 is the better option with a cheap price I’d say. I know, it’s obvious. Even then, bear with me. Let’s compare the Entry-Level model with the top of the tree (taking this article into account). The cleaning mode or the lack of it is the principle difference. Pro 3000 has three but a basic model like Pro 1000 has only the daily clean mode while 3000 has Gum Care and Sensitive Teeth. This is due to the motor of the two brushes. The 3000 model comes with a motor more powerful than 1000 which is obvious at this point. Brush heads are also different in case of the two models. Basic Oral-B Pro 1000 comes with the CrossAction brush head. The 3000 has 3D Cleaning. Also, you’ll have two additional brush heads with this one which is compatible. Oral-B 1000 doesn’t have any spare ones. Naturally, Pro 1000 wouldn’t have a storage case for brush heads like its counterpart here. The model 3000 has Bluetooth connectivity on offer. Surely a basic model like Pro 1000 wouldn’t have that. You cannot expect to track or update your brushing routines with this entry-level model. It’s only better than the manual brushes and I mentioned that in my account. While both the models have pressure sensors, Oral-B Pro 3000’s sensor is visible. It turns red when too much pressure is applied. But 1000 simply pulsates when you put too much weight into it. Also, Pro 1000 doesn’t have an automatic shutoff system like 3000. You’ll have to manually turn it off after brushing. One thing people can take solace in is the fact that the “Entry-Level” model is a lot cheaper than Pro 3000. It’s better to have this when you want to remove plaques and don’t want the special buffs. Overall, Pro 3000 is the big brother and wins the bout comfortably. Picking one of these three machines is like marriage. You choose a partner based on what you expect from him/her and what you need. For example, if you need to remove plaque and stains, I’d advise going with Oral B Pro 1000. It’s far better than the other two in this case. However, if “Gum Care” is your prime need, go for Oral-B Pro Care Plus 2000. Yes, I know… The 3000 has the same brush head for it but somehow its predecessor performs better. Well, if a sturdy battery (in terms of performance) is your goal and your teeth are sensitive, Pro 3000 should be right up to the alley for you. With this thing, one can log his/her brushing sessions and routines onto a computer and track it. Get your dentist onboard and you’ll be able to get the maximum benefit out of all the tracking and updating. Whichever model you end up choosing, keep an eye on the price. Don’t end up spending much on features and buffs you don’t need. 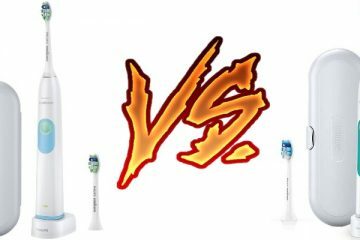 Oral b 7000 vs. 7500 : Which Electric Toothbrush Should You Buy?